Harpo plays a solitary tramp (also called Harpo) helping out a theatre company who have "the biggest smash hit since Showboat" but no money to produce it. Nor do they have any money for food, which is a problem Harpo can solve without too much difficulty. Faustino The Great (Chico) shows up on the scene because he hears that the company is looking for unknowns. He says, "You're hiring-a peoples a-never been heard of. Well, I'm the most unknown and unheard of actor who's never been on Broadway." As it turns out, the thing he is most unknown for is mind reading. He uses this skill to interpret Harpo's messages throughout the film and he also plays the piano prominently. One of Chico's best musical scenes ever is in a duet with Mr. Lyons (Leon Belasco) who plays the fiddle on a weird little medley with Chico. Intrigue enters the plot as Madame Egilichi (Ilona Massey) is desperately searching for the Romanoff Diamonds which have been lost due to incompetence on the part of one of her lackeys, and petty larceny on the part of Harpo. She will resort to anything, even torture, to get the diamonds back. 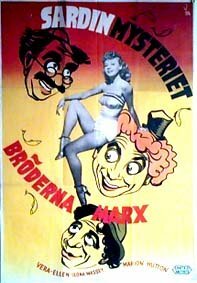 As private detective Sam Grunion, Groucho has little to do in this picture. He serves as narrator, explaining that he has been tracking the royal Romanoff Diamonds for eleven years, "...through the Khyber Pass, over the Pyrenees, round the Cape of Good Hope, and in the Gimbal's basement." 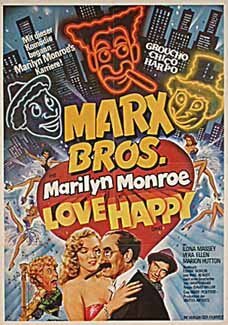 He makes a fleeting appearance later in the film with Marilyn Monroe (making her big screen debut) who is seeking his help, but Groucho is unable to ditch the plot which has placed him in the hands of a hired killer at this time. Unlike his brothers, Groucho's appearance has been altered; the glasses and moustache are now real. This is essentially Harpo's film; he also wrote the story. 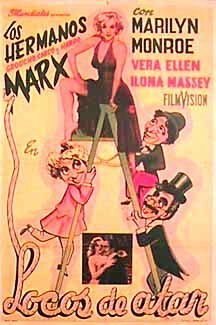 Chico's main duties are interpreting Harpo's messages and noodling on the piano, and Groucho's part is even less substantial. However, Harpo's performance in the various sight gags cooked up for him (once again by Frank Tashlin) make for a fun picture. 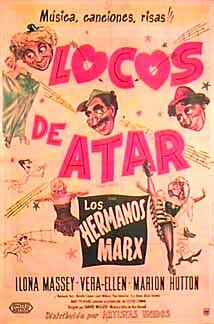 Jim Junot furnished this tidbit (from the book Groucho by Hector Arce): "There wasn't enough money to complete the film, so the producers approached different companies for investment in return for advertising in the movie. The ones who invested got their names on billboards on the rooftops. This marked the first time 'product placement' was used on a film. 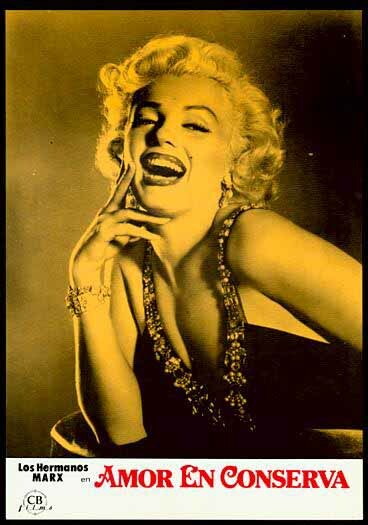 (Note: Many of the investors wouldn't contribute until Groucho was secured for the film.)"